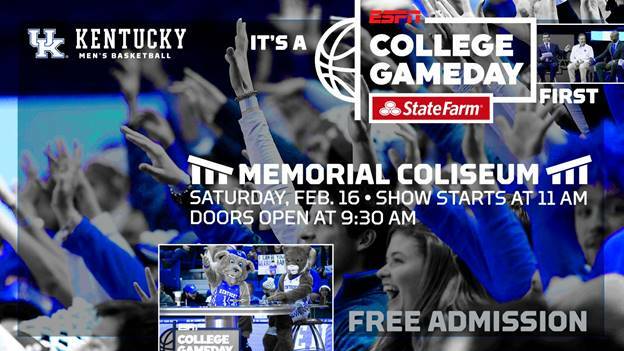 LEXINGTON, Ky. – ESPN College GameDay is coming back to Kentucky for a second appearance this season, this time with a twist. UK will host the popular preview show Feb. 16 for the highly anticipated Tennessee-Kentucky game with GameDay broadcasting live from historic Memorial Coliseum, the Wildcats’ home from the 1950-51 season to 1975-76. It’s the current home of Kentucky’s women’s basketball, volleyball and gymnastics teams and right next door to the Joe Craft Center, where the men’s basketball team practices and trains every day. Like the previous show, admission will be free and fans are encouraged to attend the event. Approximately 4,500 rabid fans showed up for the first one on Jan. 26 for the Kansas matchup, which UK won later that night, 71-63. Seats for the show will be available on a first-come, first-served basis. Doors will open at 9:30 a.m. with the live show starting at 11 a.m. Other segments from the crew for other ESPN shows will be taped prior to 11. Although Kentucky has been featured on GameDay multiple times in a season, never has it originated from Lexington twice in one season. It will mark just the second time the show has made stops at a school twice in a single season (North Carolina in 2017). The appearance will also tie North Carolina and Duke for the most GameDay appearances with 18. This one, however, will be unique because of the setting. With a classic rivalry game as its backdrop, GameDay – which features Rece Davis, Jay Bilas, Jay Williams and Seth Greenberg – will pay homage to the series’ history by returning to an arena that hosted a number of UK-Tennessee classics over the years. Later that night, Bilas, Dan Shulman and Maria Taylor will call the game from Rupp Arena at 8 p.m.
Normal game-day policies at Rupp Arena will be in place in Memorial Coliseum, including the bag policy that requires that bags do not exceed 12” x 6” x 12”. Signs will be permitted at the show, although they are subject to screening for the telecast. Parking will be available in the parking lot north of the Joe Craft Center, the lot between the Wildcat Coal Lodge and Rose Street, the student center lot and the South Limestone Garage (parking structure No. 5). All students attending ESPN College GameDay may begin lining up at the Joe Craft Center ticket entrance no earlier than 5 a.m. on Saturday. Students attending the Tennessee game may not line up at Rupp Arena any earlier than 2 p.m. on Saturday. Rupp Arena doors will then open at 6:30 p.m. and normal student ticketing procedures will be in place for the game. This is the 10th straight season Kentucky is making an appearance on ESPN College GameDay. UK won its first GameDay matchup three weeks ago vs. the Jayhawks. Although Williams notoriously picked Kansas while riding a horse to end the telecast, Kentucky proved him wrong thanks to double-doubles from PJ Washington, Reid Travis and Keldon Johnson. UK’s most memorable GameDay appearance was Feb. 13, 2010, when a record 22,144 fans attended the show in John Calipari’s first season at Kentucky. That just so happens to be the only previous time GameDay has been on campus for a game between UK and Tennessee. The Wildcats won that matchup 73-62. Kentucky has a 7-10 record in College GameDay appearances but has won its last two. First place in the SEC could potentially be on the line when the two schools meet. Heading into this weekend’s matchup. 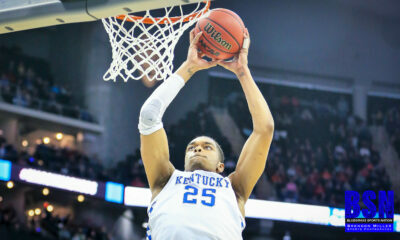 UK trailed the undefeated Volunteers by a game in conference play. Kentucky has played Tennessee more than any other opponent in school history. The Wildcats lead the overall series 154-71 and 92-17 in Lexington. 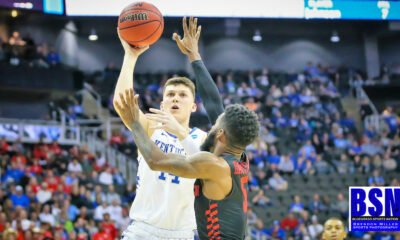 UK lost its two regular-season matchups with the Volunteers last season but defeated UT in the 2018 SEC Tournament title game. UK was 22-4 vs. Tennessee in Memorial with four matchups when both teams were ranked. The Wildcats were 4-0 in those games, including a memorable 60-59 victory vs. No. 4 Tennessee on Feb. 12, 1968, highlighted by a Dan Issel game-winning shot, that propelled Kentucky to the SEC title.